Matt made it farther than he ever had before, appreciating the cooler, slightly thinner air on Flagstaff Mountain. With triple crank gearing, Dave was a winged angel floating up the road. 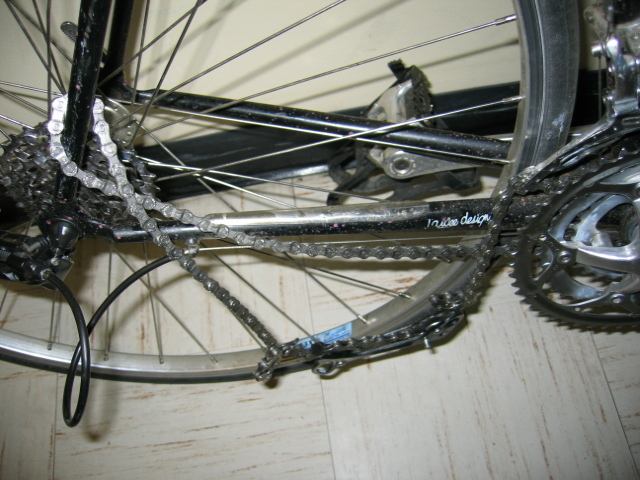 Unfortunately, his wings (and quads) overpowered his bike, as the sheer force of his pedalling shattered the whole drivetrain (see picture above). The unique frame of Greg's bike propelled him all the way to Lost Gulch Overlook, and while the mere sight of the 14% grade scared him profoundly, he still soldiered on to the stunning viewpoint of the Continental Divide. Brian made it known to all that Friday's run was a mere warm-up for his weekend sojourn: a "routine" run encompassing all peaks in the Front Range (without food or water of course). Perhaps we can do this again on Friday (March 24, 2006)?? ?